For the past three decades, Carl & Kirsten Dixon have offered travelers both the adventure of Alaska's wilderness and the pleasures of their back country kitchens. 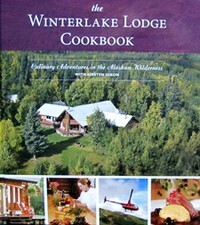 Winterlake, the log-cabin lodge nestled along the banks of a picturesque lake, with Mount McKinley looming to the north and the dramatic and active Mount Spurr, volcano to the south, has earned a worldwide reputation for exceptional adventure & cuisine. Throughout the cookbook, you'll experience life at Mile198 along the Iditarod Trail and enjoy vignettes of the Dixon's northern dream. And maybe you'll be lured by Kirsten's invitation: "If you ever have the chance to travel to Alaska, we hope you'll visit us at the lodge."